The Foodies Network has been airing old BBC videos of Jamie Oliver’s “Naked Chef” (he is really young in these! ), and when I can’t sleep sometimes I’ll watch them around 1 AM or so. I like his shows because his recipes are simple yet they all look great. Last night I watched an episode where Jamie was preparing a broiled pork dish, and after looking in the freezer today I found some pork tenderloin that I bought last week and decided I would give his recipe a spin. If you like herbs then I highly recommend the recipe. I did it a bit different from the show, but I’m working without a true oven, the same ingredients and I also did not use fresh green herbs (I used dried herbs). It is really simple to make, all you need is a pork tenderloin and some basic cooking spices. #1. 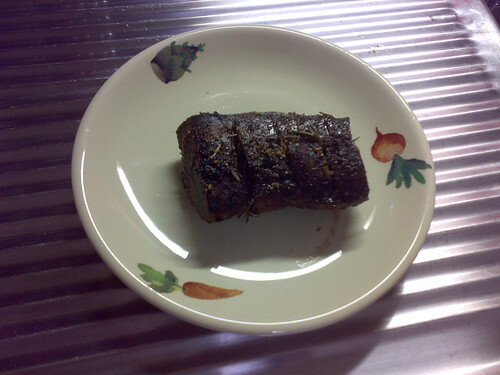 Take a pork tenderloin and cut the tenderloin into about 12~15 cm sections. In each section, cut about half a centimeter into either one or both sides of the tenderloin, separating cuts by about 2~3 cm each. #2. Take a small pinch of dried or fresh rosemary and stuff it into the slits that you cut into the tenderloin. Repeat for each slit. #3. Mix equal amounts of olive oil and balsamic vinegar in a big bowl. If you want a heavier marinade add more, if you want a light marinade go easy on it. Stir up the mixture and add the tenderloin sections. #4. (Optional) Crush some fresh garlic if desired. I resisted the temptation tonight! #5. Add sea salt and crushed pepper to your liking. I like to use rainbow peppercorns (a mix of different type of peppercorns) and grind them up and add them to the mix. The aroma of the ground peppercorns is amazing! #6. If you want to add some character, chop up some peppers very finely or add crushed pepper. I used ground Thai prik-pon peppers but anything would do. #8. While the marinade is doing its thing, heat your oven or your microwave+ovens (for people without an oven like most in Japan) to 220 degrees celcius or about 430 degrees fahrenheit. #9. When the oven has heated and the marinade has soaked into the tenderloin, get out an oven pan and place a broiling rack on the oven pan. Place some bay leaves on the part of the broiling rack where you will set a section of the tenderloin. Make sure the leaves are not overlapping and you left some spacing between them; we want the oils and fat to drip from the tenderloin to the pan. Place the tender loin on top of the bay leaves and set the timer for thirty minutes and wait patiently. #10. (Optional) Sprinkle some ground peppercorns on the surface of the tenderloin sections. #11. (Optional) If the heat is too strong, it might be a good idea to flip the tenderloin sections on their other side to prevent any over-cooking and burning. In my microwave+oven combo, this was not necessary. The result is a wonderfully tender pork tenderloin with the pleasant fragrances of balsamic vinegar and herbs like rosemary and bay leaves. On a grill this would be great too I think, but because I do not have a grill I have started broiling things more often. While broiling is a great way to cook, it does create quite a bit of smoke if you’re not on your watch. This is due to the fats and oils that drip from the meat on the broiling rack to the surface of the oven pan. Often it will start to burn and turn black on the surface of the pan and proceed to smoke out your kitchen. You can either add water to the oven pan so that this does not happen, or you can open up your windows and turn on your ventilator.